Instant Replay Review upheld 1B Umpire Quinn Wolcott's safe call in the top of the 3rd inning of the Astros-Angels game. 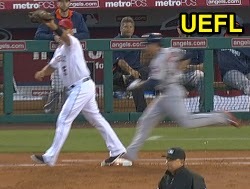 With none out and one on, Astros batter Alex Presley hit a 0-2 fastball from Angels pitcher Jered Weaver back to Weaver, who threw to shortstop Erick Aybar to first baseman Albert Pujols as Presley arrived at first base, Astros baserunner R1 Jesus Guzman out at second. Upon Replay Review as the result of a challenge by Angels Manager Mike Scioscia, Wolcott's ruling was affirmed, the call was correct. At the time of the review, the contest was tied, 0-0. The Angels ultimately won the contest, 2-1. This is Quinn Wolcott (81)'s ninth Replay Review of the 2014 MLB Regular Season. This is Crew Chief Gerry Davis' 19th supervised Replay Review of the 2014 season. This is the 335th Instant Replay Review of the 2014 MLB Regular Season. This is Angels Manager Mike Scioscia's 12th Replay Review of 2014. Umpires are now 175/335 (.522 Affirmation Rate) in Replay Reviews during the 2014 MLB season.